I am delighted to introduce you to another fellow English teacher. 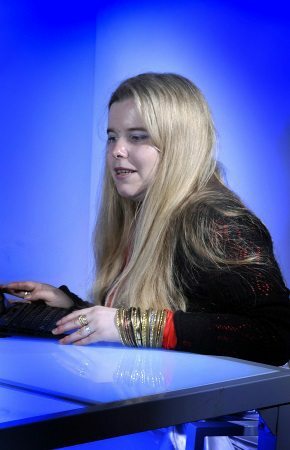 Kirsty Major first approached me a year ago to appear on her podcast, English with Kirsty. I am ashamed to say we still haven’t recorded an episode together. All my fault. 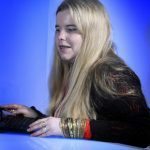 However, being someone who perseveres, Kirsty contacted me earlier this year asking me if she could write a post on small talk for my EWAT community. I was only too delighted to accept especially as small talk is a key business skill every professional needs to master if they are to succeed in business. And mastering small talk in English if it’s not your first language can seem an impossible challenge. 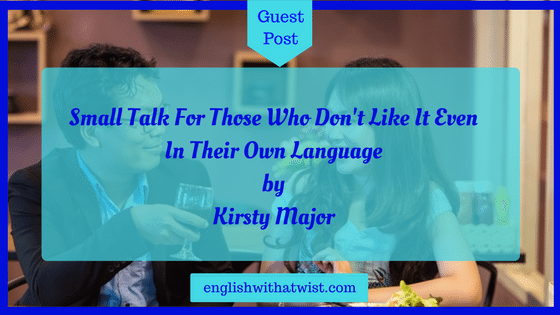 In this post, Kirsty addresses how you can engage comfortably in small talk in English, even if small talk doesn’t come naturally to you. I work mainly with people who need to use English at work. Most people come to me because they want to improve their speaking skills, but generally it’s not the technical presentations or the detailed descriptions of their products that cause the problems. No! It’s the small talk. You never know exactly what the other person is going to say, or whether they will keep the conversation going. Nobody wants to stand there, feeling awkward, and wishing that they had a brilliant reply or an idea that would keep everyone talking. I quite like talking! When I first started learning German, taking part in social gatherings was a problem, because I didn’t have the confidence to say everything that was in my head. Most of it was right, but if I couldn’t be sure about that tiny grammar point, I’d agonise over it until the moment had passed and I had no chance to add what I wanted to say. Not the best strategy! I talk a lot at work and I can get most people into a conversation about something or other, but I do struggle more with big crowds, whether they are speaking German, or my native language. I believe I’m not alone. There are more people like me who either can’t be bothered to fight to make themselves heard, or who don’t see the point of talking about something which is completely irrelevant to them, just to have something to say. When I asked one of my friends why he doesn’t like small talk in his native language, he said that he didn’t want to be false and pretend to be interested in topics that bored him. I can understand this, and I feel like this sometimes, but I find it easier to focus on small talk as a tool for getting to know someone, rather than the topic, which could indeed be at best superficial and at worst a bit dull at first. I think some teachers believe that it’s just a matter of learning enough new words and having the confidence to use them, but really, people have a variety of communication styles and preferences in their native language, and these often play a role when it comes to speaking another language. I’m not here to say it’s ok not to get involved in small talk! Far from it! I would like to offer you some tips on how to engage in small talk in English, even if you don’t enjoy small talk in general. When I was younger, I had a guide dog who helped me to get around because I’m blind. She was a big, happy golden retriever and many people loved her. The problem was, it was always the same. I’d settle down on the train after a long day at work, on my long commute out of London ready to read my book. Then people would decide they wanted to talk to me. Yes, I did know my dog was beautiful, and her name and age were the same answers I gave when someone else asked me a couple of hours before! There is nothing wrong with the questions, but when you go through the same ones again and again, it can feel a bit pointless. A bit like talking about the weather, a popular thing to discuss in the UK! The thing is that the questions weren’t always pointless. Sometimes they were just a way to start a conversation. Sometimes it never went past the “what a pretty face” stage, but sometimes it ended up with me finding out from one lady about a charity that helps lost dogs, another man recognising me from a previous conversation and giving me train information that hadn’t been announced, and a third lady became a good friend with whom I went on a couple of weekend breaks and who introduced me to some of her friends. A group of us even ended up spending Christmas together! Without those seemingly pointless beginnings, or the general questions that I’d answered a million times before, the rest of the relationship would not have developed. So what can you do if you don’t enjoy small talk? #1. See it as a means to an end. Don’t think “this is pointless/boring/a waste of time”, but see it as a way of getting to know the other person and for them to get to know you. It’s the wrapping paper on the Christmas present! You can’t get to the present inside unless you first take off the wrapping paper! Don’t feel pressured into believing it’s something you’ll grow to love. Maybe you won’t, but it’s often part of the job, so if you don’t love it, settle for developing strategies that will help you to make the most of it. #2. Join a hobby group. If small talk in general is hard for you, small talk in English will be even harder. Maybe you could join a hobby group in your native language so you can first develop the habit of talking to new people within the group. If you’re worried that you’ll run out of things to say, think of some ways you can keep conversations going and avoid awkward silences. These include things like finding common interests, asking questions based on what the other person has just said, and bringing other people into the conversation. If it’s a social event and you’re really not looking forward to it, set yourself a time limit. Of course it’s better if you try to enjoy yourself, but if you really struggle, it’s easier if you know you’re leaving at 10 o’clock, rather than waiting for the last person to leave. This is easier in larger groups than on a one-to-one or small group basis, but it can give you something to work towards. If possible, move around. This won’t work at a sit-down meal with allocated seats, but maybe the people on the next table are talking about something to which you can contribute more. You won’t know unless you go and find out! One to one conversations are often easier than large groups. Can you start up a conversation with someone who’s on their own? They may well thank you for it! If your interests are different from most of your colleagues and this makes it harder to get involved with small talk, find a podcast or a news site that gives you information about current affairs. I’m not suggesting that you start a heated political discussion, but the internet is full of interesting news and stories. Flipping through film reviews means that you know what they’re about without having actually seen the film. If you’re going to another town, having a look online will give you ideas of things to ask or talk about in relation to that place. Failing that, the weather, the event you’re attending, holidays, travel, and food are all pretty safe topics! You don’t have to do all the talking. Sometimes it’s enough to ask good questions. You’d be amazed how much some people enjoy talking about themselves! Of course you don’t want it to be too one-sided, but getting other people talking is a good way to keep in the conversation and not have to talk as much, if this is something that you feel less comfortable doing. We call it small talk, but conversation is a give-and-take process that involves talking and listening. To be good at talking, you have to be good at listening as well, and people definitely value it if they feel someone is really listening to them. Also, you can learn so much about other people if you actively listen, which makes it easier to develop a business relationship with them. One of the reasons why some of my students struggle with small talk is that they feel they don’t know enough words to express their ideas. Reading, listening to English and finding someone with whom to speak informally, such as a language exchange, are all good ways to fix this problem. Bear in mind that you might find small talk uncomfortable, but approaching people that you’ve just met for the first time with deep and meaningful conversations has the potential to make them feel uncomfortable too! It’s all about balance! Maybe your conversation partner will get away from trivial things that you find boring, but it’s usually safer to start with the weather! So, whether you love it or hate it, small talk is a part of our daily lives, and it does help to make connections with people in a way that business emails or project-specific calls can’t. See whether you can try to make it something that works for you, rather than something to be avoided at all costs! where you will also find her blog and her podcast. Thank you very much, Kirsty. I hope you enjoyed this post. If you are like me and feel that your colleagues should know about English with Twist and join the community of professionals, then you know what to do….yes, share this post. And if you haven’t joined the EWAT community, what are you waiting for? 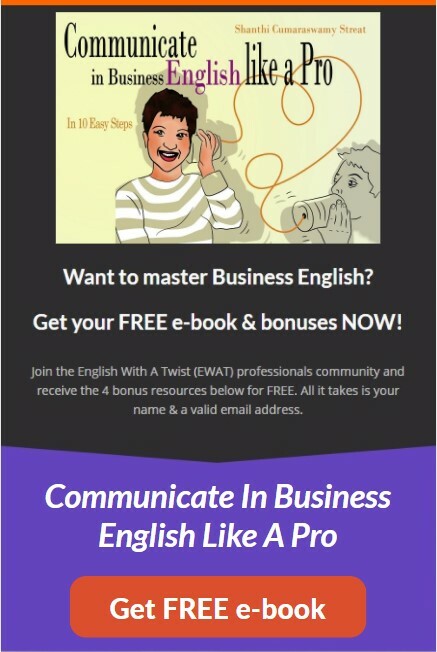 Sign up below and start mastering your Business English skills. A great post. Small talk is hard for me too. And asking people open-ended questions is my survival tactic for most social situations in English or French! Open questions are a must every time! Take care, Trisha. Hope all is well with you.